Excuse me while I squeal! If you follow me on Twitter you already know of my frantic search for the elusive new issue of Quick Quilts magazine that features a 2-page spread on yours truly. I tweeted from my local Barnes & Noble last Friday morning, then from Borders, then from Joann's and even from my local grocery store. No one had it. I was so bummed. I even tweeted when I failed to find it at the big Borders in Chicago last Saturday. And yes, I am getting complimentary copies from the editor, Lisa (who, by the way, just gave birth to an adorable baby boy and still took time out of her busy schedule to email me electronic copies of the spread... so sweet!) but I just wanted to, you know, walk by a busy magazine section, casually pick up the issue and just go "well, will you look at that?!" I'm sure you've already figured out that I finally found it. Yep, I went to Walmart this morning to pick up a couple of things and there it was! I almost didn't believe it and there was no one around for me to proudly shriek to, well, except for Sydney. I shoved the mag in her face (even pointing out the picture of her in the top) and her response was "UGH! Is it lunchtime yet?" Oh well. I'm super excited nevertheless. My first magazine appearance! YAY! So glad you finally found it! Lookin' good! CONGRATS!!! Congrats! How cool. It looks great. I'm glad you were able to find one. Must've been such a rush seeing it when you didn't expect to. W00T! Congrats to you, Patty!! How exciting! Congrats, Patty! By the way, what kind of orchid is that in the photos? YOU GO GIRL! It is so thrilling to have your work validated by your peers......CONGRATS! That is so great! I haven't seen that one yet but do buy it on occasion, will definitely have to buy it now! You sound like me today. The new Quilts and More came out today and I went to 8 places to look and called 3, no-one had it yet, grrrrrrrrrrrrrrr. My DH seriously thought I was CRAZY!!!!!! I must be, I have no excuse but wanting to make the cute purse on the cover, it's not like I was FEATURED in it! Congrats!!!! Congratulations. You deserve the spread! I just subscribed to this magazine about a week ago, and I can't wait to start getting it. Now that I know you're featured in the March issue, I'm really hoping that this will be my first issue and not the next one. I will have to check Walmart if I don't get a copy in the mail. I am so super duper happy for you Patty. You so deserve this sweetie. I can't wait to get my hands on my own copy. CONGRATULATIONS! Congratulations, Patty! How exciting...glad you found the magazine! Hope I can find a copy as well! Josh... I guess I have never mentioned how horrible I am with plants. I can't keep anything alive. The one in the zebra pot is a "rubber plant"(?) I think. They are hearty like a cactus and even I can't kill them! LOL! The other one in the blueish pot is actually an artificial plant. Don't know what it is but it definitely doesn't look like an orchid at all. It just has little purple buds at the top. Congrats, Patty! Well deserved! I can't wait to get my hands on a copy! I saw it Saturday already here in BC, Canada in the grocery store. I didn't know it was so new. :-) Very fun to see yourself in print! Congratulations. If I would have been in that WalMart with you I would have participated in your happy dance. I know that had to have been exciting! And I have to agree that I can't believe that was your first time in a mag.... you are one talented chica!!! Congrats Patty! That is so awesome! 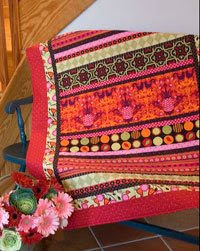 Today I picked up Quick Quilts and my Quilts and More I've been looking all over for, GREAT spread Patty!!! Christy (little*shamrocks) - I can't remember my blogger identity so it's anonymous!